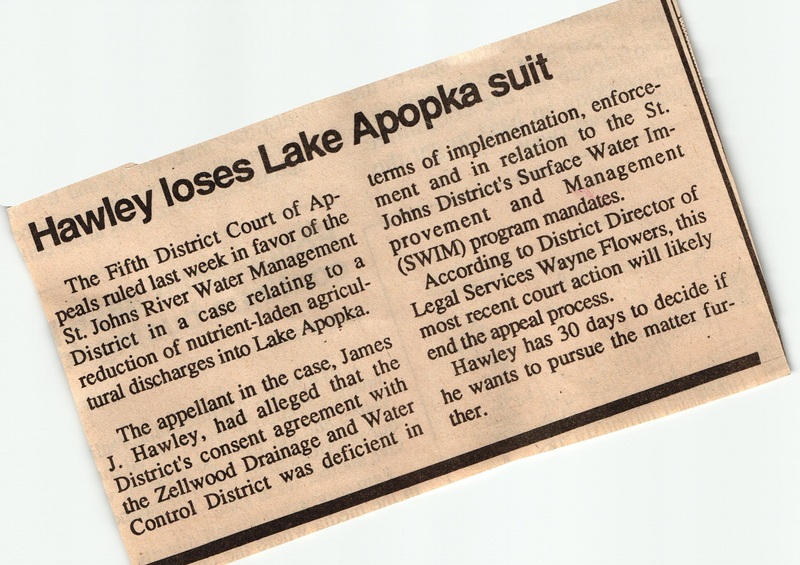 I mentioned last week the publishing by the St Johns Water Management District, in 1994, of a waste load allocation rule that would limit what the Apopka farms could discharge. The other claims involve sections of the rule as being “arbitrary and capricious”, as well as questioning whether, in setting a water quality standard, the SJRWMD exceeded its authority.The scientific reasoning behind the rule was also disputed. The DUDA farms, also on the north shore, but west of the Zellwood District, initially challenged the waste load rule as well. However, after discussion with the WMD, they voluntarily constructed holding ponds for their waste water, as well as a pipeline that would take their discharge and disperse over land that would help it naturally filter out the phosphorus. After this, they voluntarily dropped their challenge. FOLA filed to intervene in the petition. Unfortunately, in August 1995, the challenge was upheld, and the rule deemed invalid, as it was agreed the SJRWMD had exceeded its authority in setting water quality standards. This wasn’t the only thing going on in 1995. Other restoration work included the harvesting of gizzard shad from the lake, continuation of planting aquatic vegetation in the lake’s littoral zone, and studies of alum treatment as a way to reduce phosphorus in the lake. But projects like this would be meaningless if the phosphorus discharge could not be stopped. One method was something called “upland disposal”. This was another pet project of FOLA’s, and involved disposing of farm discharge into different types of basin that would remove the phosphorus from the discharge. This project received support from Linda Chapin, Orange County Chairman. So that’s 1995, mostly. Next year will see things really heat up, as the farms decide a buyout is the only way they can “reduce” their phosphorus discharge. After forming in 1991, FOLA’s first meeting was held in January 1992. 1992, for Lake Apopka, was relatively quiet, compared to the next fear years. Completion of a nutrient budget plan, for the next two years. One interesting finding of this plan was evidence that as algae is removed from the flow-way, which I previously discussed, the remaining algae in the lake becomes further enriched in phosphorus, making subsequent algae removal even more efficient in terms of removing nutrients. A hydrodynamic modeling plan, started in May 1992, to be completed in 1994, per the SWIM plans. Completion of the “Icthyofaunal Restoration Project”, which found stocking of bullhead carp in Lake Apopka to be generally unsupported, due to high mortality. Construction of barriers, installed in the lake’s littoral zone. These would hamper wave action, thus protecting shoreline vegetation. In July, planting efforts were begun, using species like giant bullrush, spatterdock, and pondweed. What was FOLA, then, up to during 1992? One early success of the year was a successful blocking of a proposed bill by Representative Sindler. Though I haven’t located the text of the bill, a letter from FOLA President Jim Thomas to Sindler outlines FOLA’s concerns. Mainly, the bill seems to have aimed at creating a new agency to help restore the lake, and FOLA felt this would be both inefficient and detract resources from the existing plans. Other, less glamorous activities continued during the year, like fundraising, recruitment, and seeking support from government officials. The next year, 1993, would see FOLA assisting in a restoration project at Magnolia Park. This park is on the east side of Lake Apopka, and the shoreline there was restored using native vegetation by FOLA and volunteers. Today, Magnolia Park is also one of the trailheads to the North Shore Restoration Area, where the muck farms once were. 1994 is where things get interesting. The SJRWMD published a waste load allocation rule this year, that would set stringent requirements on the amount of nutrient discharge allowed by the farms. This rule would be made public in Fall 1994 and then open to challenge by the affected parties. The farms would challenge this ruling, but the developments on this issue I will have to save for next week. Another interesting note from 1994: in a position paper published at the end of that year, FOLA states they do not support a farm buyout of the muck farm lands. Evidently this was being discussed. FOLA states that the economic impact would be too major, and simply buying the muck farms won’t prevent discharge from adjacent properties. FOLA would eventually come to support the farm buyouts. More on this later. This week, I’d like to discuss the formation of FOLA. The archives have lots of documents discussing the issues leading to FOLA’s formation. I’ll try to summarize them here. The Friends of Lake Apopka began as a Legislative Action committee, part of the West Orange Chamber of Commerce. In 1991, in reaction to certain actions taken by the St Johns Water Management District, it was decided to split off into their own independent group. To give the full context, we have to go back to 1988. According to these minutes from the WOCC, prior to 1988 “pumped discharge” (i.e. from the muck farms) was regulated by the Florida Department of Environmental Regulation. (The DER is now part of the Florida Dept of Environmental Protection). In 1988 this type of regulation was delegated to the SJRWMD. Also noted in these minutes: In 1989 the SJRWMD signed a consent order with the Zellwood Drainage District. This 1989 order is in the archives. It’s 20 pages long. 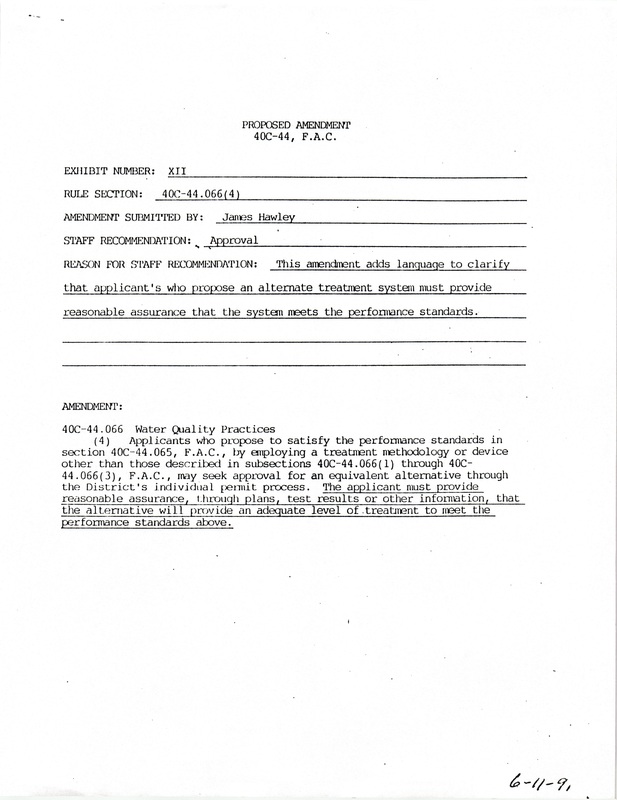 The archives also hold a document noting various issues with this consent order, written by Jim Hawley. Some of the major concerns include various loopholes and ambiguities in the language of the order. A major issue is the duration of the order: it would allow the ZDD to continue dumping phosphorus for the next 10 years. This consent order was challenged. Various amendments were drafted, attempting to strengthen the language of the order and shorten its duration. None of these were sucessful. The archives also hold several of these proposed amendments, some of which include comments by SJRWMD staff. Another issue with the consent order was the lack of holding ponds required for Zellwood. One point in favor of these ponds was their successful construction by the DUDA farms which neighbored Zellwood on the North Shore. DUDA had begun construction of retention ponds back in 1989. Zellwood, though, felt these ponds weren’t economically feasible for their own holdings. 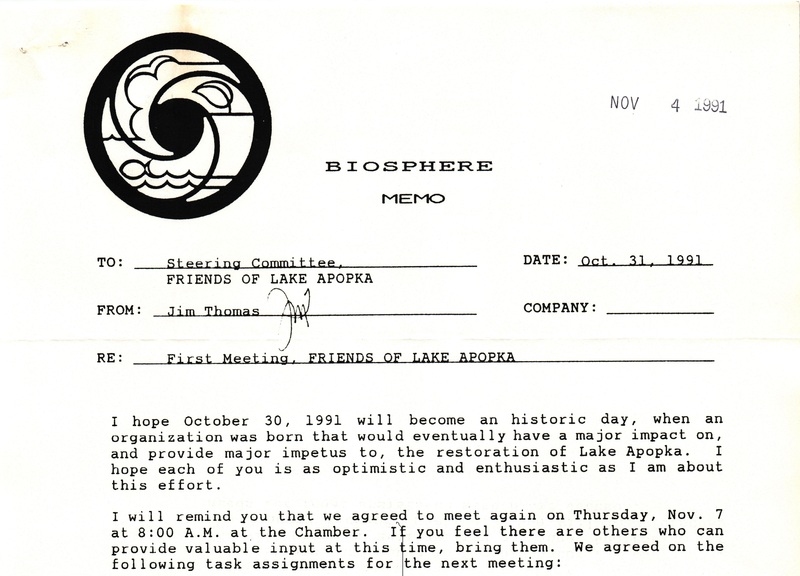 So, after the consent order was upheld and finalized in October 1991, the Friends of Lake Apopka were formed. A position paper was drafted, outlining FOLA’s major concerns and potential routes towards restoration. Letters were sent to various Florida officials, including the Governor, Lawton Chiles. A recruitment drive was began, soliciting members from the various communities around the lake, as well as corporate sponsors. The first meeting was scheduled for January 14 of the next year. 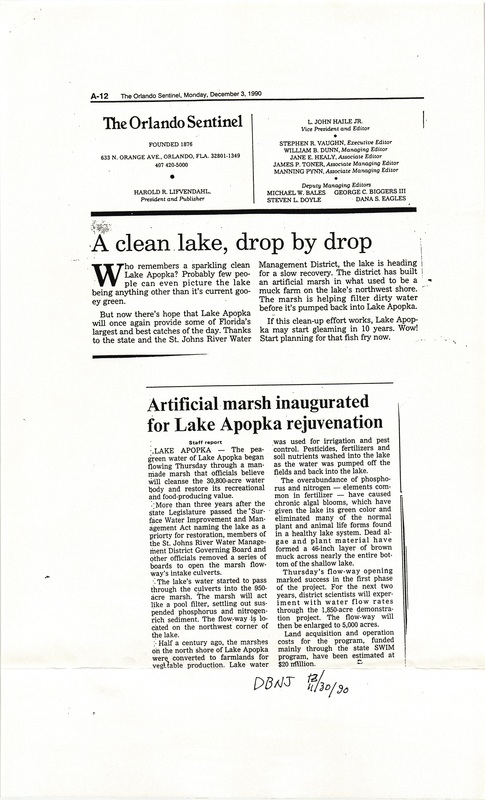 In 1985 Governor Bob Graham formed the Lake Apopka Restoration Council. Like its predecessor of the 60s, the Lake Apopka Technical Committee sought to determine water quality standards for the lake, and investigate potential routes towards restoration. After meeting in March 1986, the Council determined a set of standards that would make the lake suitable for recreation and fishing. The archives, unfortunately, don’t have any documents from 1986 to 1989, other than the Council’s 1986 statement of intent. The FOLA timeline states that the St Johns River Management District, responsible for Lake Apopka, began initiating restoration projects that had been recommended by the Council at this time. One of these projects was what would become the Marsh Flow-Way. In 1987 SWIM was passed, designating Lake Apopka as a priority body of water. 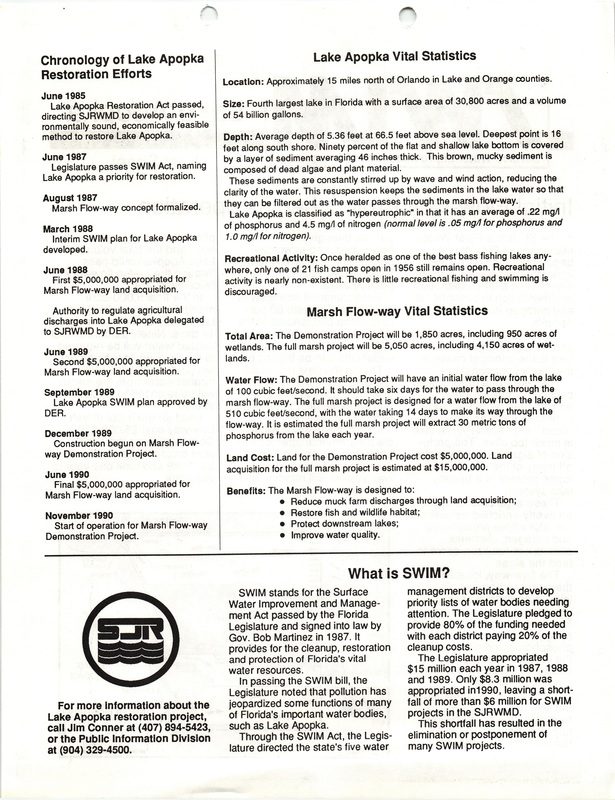 SWIM would increase funding for the lake’s restoration, and in 1988 the Flow-way Pilot Project was begun. The SJRWMD purchased 5,000 acres of land on the northwest corner of the lake, and construction of the project began December, 1989. Here’s part of a SWIM factsheet discussing the flow-way. 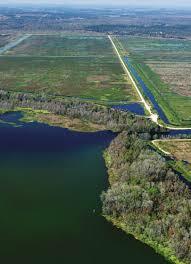 The flow-way is essentially a wetland, using natural processes to remove sediment and phosphorus from the lake. The vegetation slows incoming sediment and helps it to settle to the bottom. The vegetation also blocks the wind, preventing it from churning up the water and reintroducing the sediment into the water column. This is one of the major problems for the lake itself – with such a large surface area and shallow depth, wind has an enormous effect on the lake’s bottom. Vegetation also plays a role in nutrient uptake, directly absorbing nutrients from the water. I think the flow-way should also be understood in contrast to other biological nutrient removal processes that use non-native species. The flow-way, though manmade, uses native wetland species. I’ve mentioned the usage of hyacinth, for example, in nutrient removal systems. As I showed you earlier, this is a highly invasive species with a serious potential to escape any system it’s confined to. This “experimental operation” would be finished in 1997, as the farm buy-outs were gathering steam. A full-size plan would be drawn up. In 2001 the Flow-way began phase 1 of its operation. The flow-way treats around half of the volume of the lake yearly, but this is highly variable. In this photo, north is to the right. You can see the flow-way’s cells in the top half of the photo, emptying into Lake Apopka. Notice the contrast between the blue water leaving the flowway and the green “soup” of the rest of the lake. The flow-way is important because simply halting discharge of nutrients into the lake isn’t enough to restore it. The nutrients must be removed to help the lake back into more stable conditions. From 2003 to 2009 the flow-way removed 37,000 lbs of phosphorus, along with 62 million pounds of loose sediment. 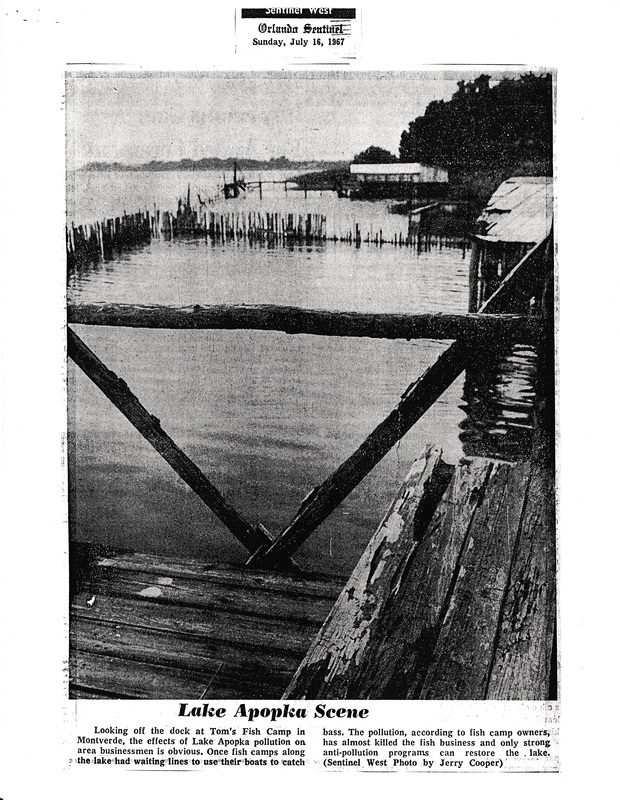 The photo shows the docks of Tom’s Fish Camp, on the shores of Lake Apopka near Montverde, in 1967. The camp’s in a state of disrepair – the sportfishing industry declined sharply in the 1960s, as algae and scum began choking the game fish out of the lake. A lot better days for Tom’s Camp! The 1940s were the sportfishing glory days for Lake Apopka. The archives have dozens if not hundreds of photos of fish camp visitors holding up huge strings of bass. I claimed in an earlier post that Cary Grant visited the lake – this was incorrect. It’s actually claimed that Clark Gable visited Lake Apopka, though it’s difficult to substantiate this claim. That link gives more information about the hotel. 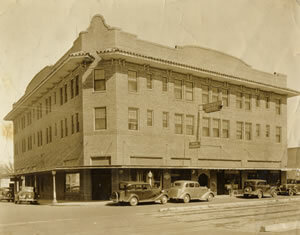 Unfortunately, I haven’t found any documents about the hotel in the archives, but the Edgewater would have been the nicest hotel by far in the area at this time. It’s still there in Winter Garden today, right on the main street through town. That article discusses the purchase of the camp property by a private owner. The owner had the cabins removed. Where did they go? One was given to the town of Montverde to be used as a museum. One was given to a local Montverde family with an interest in the camp’s history. The last cabin? It was donated to the Oakland Nature Preserve, the home of these archives. You can see it as you drive in! It’s a little hard to tell which cabin this is from the 1940s photo, but if I had to guess, I’d say it’s that cabin on the far left. I’ll be taking some more photos of the cabin from other angles next time I visit the preserve to better determine this. I’m not sure if you’re allowed to enter the cabin, but I’d like to try and get some interior photos as well. According to some sources, this cabin was built in the early 1900s! And here it is over a hundred years later. Last week I discussed the 1970s and how Lake Apopka was seemingly passed over by the wave of environmentalism that swept Florida at that time. This wasn’t totally accurate: the Clean Water Act and various other measures did, in fact, impact the lake. As a result of these water protections, Winter Garden’s citrus processing industry and sewage treatment plant began taking serious steps to reduce their discharge into the lake.. By the end of the decade both of these sources of pollution would have greatly improved their treatment processes. The muck farms, though, were overlooked by these protections because their discharge was deemed a “non-point” source. Non-point pollution would become a more visible topic in the late 80s and early 90s. 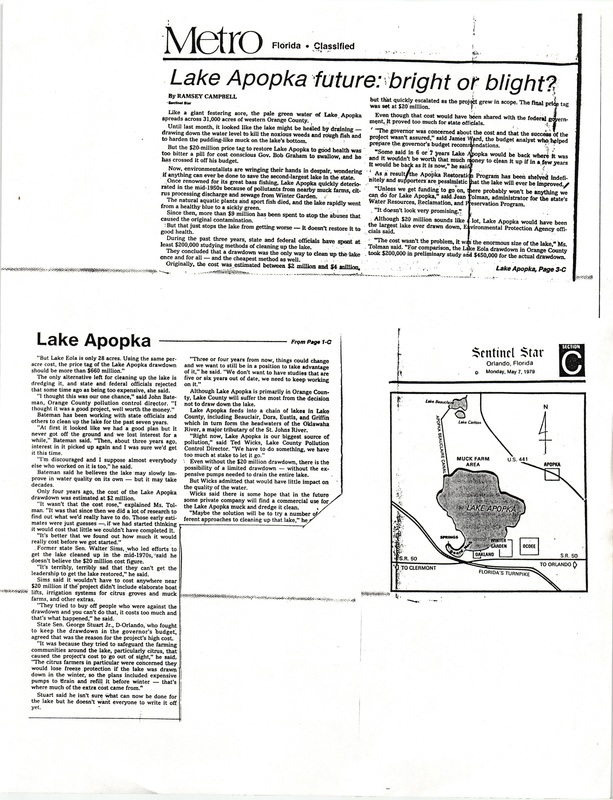 The 1980s saw a lot of major plans beginning for Lake Apopka. Ironically, this period is not one well-represented in the FOLA archives. Due to this, piecing together a narrative for this period is going to require a bit more research than previous weeks. I want to spend this week, then, giving a brief overview of some of the major events. The decade seemed to start hopefully, with the Florida Game and Freshwater Fish Commission even stocking the lake with over 150,000 bass fingerlings, in an effort to restore sports fishing. But this wouldn’t work. In fact, the next year, the FOLA archives show another major fish kill occurring. Described by Harold Moody as “massive”, one report estimates the kill at some 18 million dead fish. The middle of the decade, though, would see the passing of the Lake Apopka Restoration Act. This legislation established the Lake Apopka Restoration Council and Technical Committee. The archives holds a three-page Statement of Intent by the Council. I’ll go through this in more detail next week. What’s most important is the LARC’s undertaking major studies to develop a comprehensive plan for the lake, and one that would integrate the Water Management District. Several pilot projects were launched by the LARC in ’86, and “nutrient budgets” are being developed at this time as well. The archives contain several examples of these kinds of “budgets” – we’ll go through one in the future. In 1987 SWIM is passed: the Surface Water Improvement and Management Act. SWIM would help put Lake Apopka back at the center of Florida’s environmental concerns, naming it as one of seven priority bodies of water to be restored. In 88′, the first flow-way demonstrations are begun. The flowway will become a massive “filter” for the lake, cycling the entire volume of the lake twice per year. 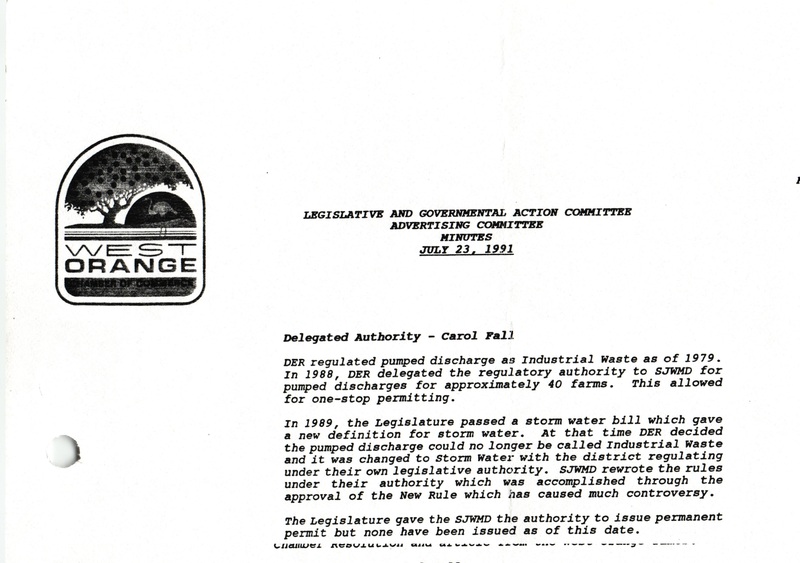 And finally, in 1989, the St Johns River Management District signs a consent order with the Zellwood Drainage District. This agreement would set the guidelines for Zellwood’s water usage. This agreement would prove highly controversial, eventually spurring concerned citizens to form what will become the Friends of Lake Apopka. This also deserves more detail, in a future update. Stay tuned. I wrote last week about the Lake Apopka Technical Committee and its efforts towards Lake Apopka restoration. While I’m still tracking down the exact end of this committee, it doesn’t look like it survived the end of Kirk’s tenure as governor. I have yet to come any concrete steps taken by the committee towards restoration. This is partly due to a gap in the documents from 1969 to 1972. There’s only a few pieces of correspondence from 1969, and then nothing at all until 1972. 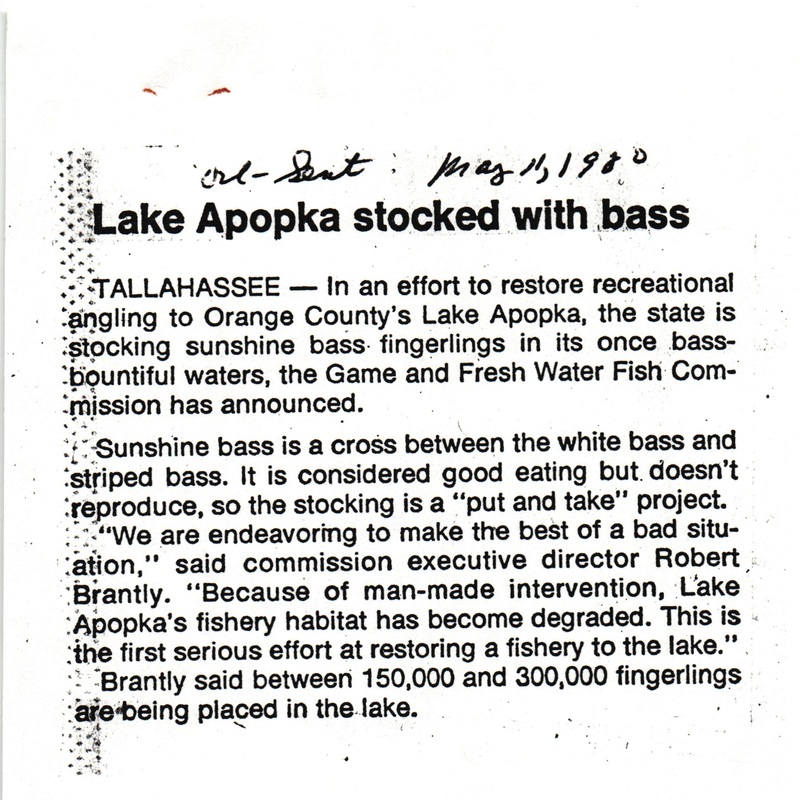 The 1970s weren’t a very productive time for Lake Apopka. The documents show a series of delays and institutional foot-dragging. This is interesting because environmentalists achieved some of their greatest successes during the 1970s – the Clean Air Act in ’70, the Water Pollution Control Act in ’72, and the Endangered Species Act of ’73. These are all at the national level, under President Nixon, but locally, Florida, too, was experiencing some of its greatest environmental successes. Conservationists succeeded in halting the construction of the Cross-Florida Barge Canal, a decades-long project that had been fought against almost since its inception. In South Florida, construction of a proposed jetport, slated to be built in the sensitive Big Cypress Swamp area, was also halted. The State legislature passed numerous environmental protection laws, like the Environmental Land and Water Management Act of 1972. Federally, Congress succeeded in passing the Kissimmee River Restoration Act in 1976, which sought to restore the river from its heavily channelized state. Clearly, the environment was on people’s minds. So why, then, did Lake Apopka get little attention? One answer is a new awareness of how monumental a task restoring a lake 48 square miles in size would be. 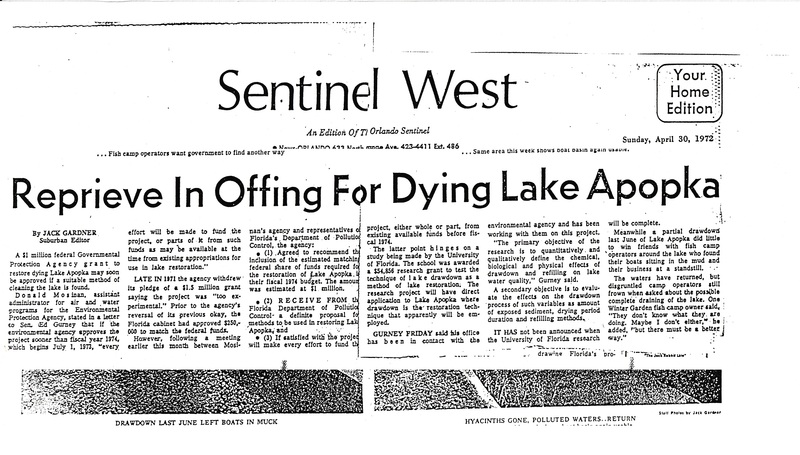 That article, from 1972, discusses some flip-flopping by the EPA regarding funds for Lake Apopka. The EPA had pledged 1.5 million dollars in 1971 for restoration. At the time, the method of choice was “drawdown”. This means lowering the water level, exposing the muddy bottom to the sun. The hope was that this would help consolidate the mucky bottom, making it suitable for plant life. It would also keep nutrients in the muck sequestered, preventing them from entering the water column. The EPA felt this method was “too experimental” and withdrew their pledge, only to re-pledge the money if follow-up studies could be made. That was in 1972. A news article from the next year shows the estimated price of drawdown had risen to $2 million, and wasn’t expected to begin until 1977 at the earliest! By 1976, plans had again stalled. The cost, then, had risen to $2.8 million. Studies still needed to be performed before drawdown could begin. Here’s an article from 1979, talking about “years of delay” with the project. The project is now being estimated at costing $20 million. Reference is also made to a drawdown of Lake Eola, which was being used as an example of how successful drawdown could be. This article states that if the costs of the Eola drawdown were extrapolated to a lake the size of Apopka, the cost would be more than $660 million dollars. So: the 1970s, a golden age for environmentalism in the country and in Florida, didn’t do much for Lake Apopka. My gut feeling is that environmentalists during this period wanted to focus resources on environments that could be “saved”. Lake Apopka was seen as something of a lost-cause. Alongside the news articles from the 70s discussing the drawdown plans is correspondence from several citizens who had their own project: saving the Gourd Neck Springs area. This section of the lake, shaped like a gourd, holds the only springs in the lake. The Technical Committee, in the late 60s, explored separating this section of the lake with a levee. This would eventually result in a much clearer section of lake, that could possibly be used as a fish nursery. This never happened, either. By the 70s, a few citizens were working to get this area recognized and protected by the state, possibly as a State Park. The correspondence shows various ways they tried to achieve this, including working with the Audubon Society. Ultimately, these efforts would fail too. Meanwhile, the muck farms were farming as usual, continuing to use the lake as their personal retention pond.